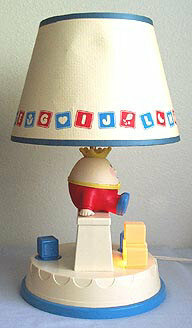 Description: This brightly colored nursery lamp lights a room with a standard 60 watt bulb, it has a small night light, and plays an 18-note wind-up music box. 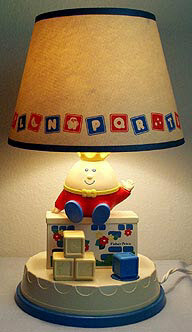 The lamp has a permanently attached Humpty Dumpty figure sitting on a white plastic (brick-simulated) wall. There are also blue and yellow blocks on the round base. The round lamp base is white with a blue rim around the bottom. The blue block winds the music box, and the yellow blocks cover the nightlight (the light is behind the blocks). 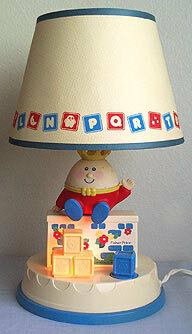 The music box plays over five minuites of "Humpty Dumpty", and the nightlight requires a standard 7-1/2 watt bulb (included). FPT20218 - Round cover that fits on the bottom of the FPT10275 lamp base. This covers the light bulb and nightlight outlet. The cover has a raised oval-shaped handle in the center of one side and is marked with open and close arrows and marked "MAX 7-1/2 WATT TYPE-C BULB". Measures 2-5/8" diameter. WFL: 07-AJ-02-C-B. FPT10277 - The lamp was sold with a textured lamp shade that is made of high-impact styrene for years of use. The lampshade has blue trim around the top and bottom openings, and blue and red blocks along the lower edge. The blocks are marked either with white alphabet letters, or with white shapes, such as a kite, moon, flower, etc. TOT18 - Small white replacement lamp shade without the Puffalump design used on the proper Puffalump lamp shades. NOT a Fisher-Price product. TOT56 - Replacement bulb features better-than-original brightness and longer life design. Use one bulb per lamp, but you might also want to keep a spare on hand. Also see #47 Deluxe Musical Rocking Horse Nursery Lamp for a similar lamp.